=Studies have shown that millennials are the “cynical” generation, that very few believe other people can be trusted. 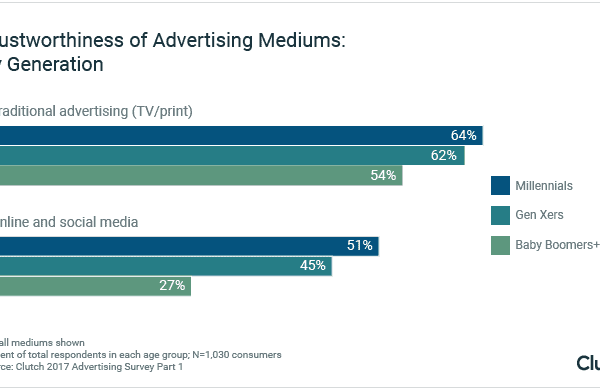 Yet when it comes to advertising, the opposite is true: According to a new Clutch survey of 1,000 consumers across the U.S., millennials trust advertising more than older generations. About 55 percent of millennials trust advertisements to be honest in their messages; 44 percent of Baby Boomers say the same. 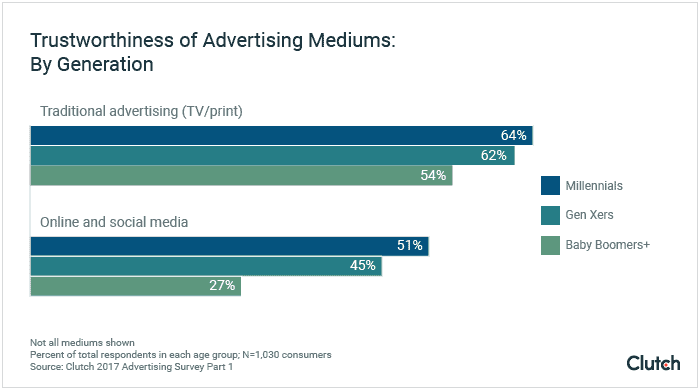 That number is more dramatic when looking at traditional advertising (TV and print) vs. newer forms of advertising (online and social media). More than half of both millennials (64 percent) and Baby Boomers (54 percent) trust traditional advertising, but almost double the number of millennials trust online and social media advertising (51 percent) than Baby Boomers (27 percent). Just like with trust, advertising influences millennials much more than Baby Boomers; advertisements influenced 81 percent of millennials to make a purchase in the last 30 days but just 57 percent of Baby Boomers. TV is the most influential advertising medium for all generations, but millennials are more likely than Baby Boomers to make a purchase after seeing or hearing an advertisement on all mediums. More than half of both millennials (65 percent) and Baby Boomers (51 percent) say they have made a purchase after seeing a TV advertisement in the past 30 days. Just under half of all generations have made a purchase after seeing a print advertisement (44 percent millennials, 40 percent Baby Boomers). However, online and social media advertisements influence 58 percent of millennials but just 22 percent of Baby Boomers. 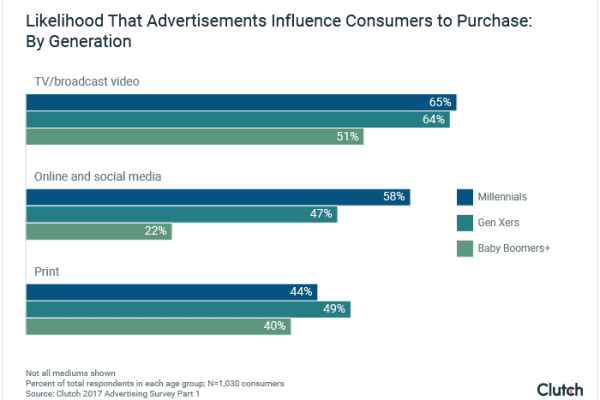 About 90 percent of all consumers are influenced by advertising, but as millennials develop more buying power, companies would be smart to aim advertisements toward them. Clutch’s research shows that millennials are more influenced by advertising because they are more spontaneous and open to trying new products and brands, whereas older generations already know their preferences and are less likely to try new things.